1st Prize winner of the Queen Elisabeth Competition 2017 in Brussels, as part of the first edition dedicated to cello, Victor Julien-Laferrière also won the 1st Prize and two special prizes at the 2012 Prague Spring International Competition. In 2018, Victor Julien-Laferrière won the Victoire de la Musique in France as “Best Instrumental Solo”. 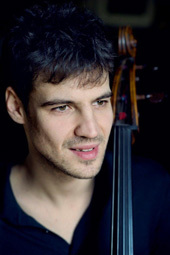 Born in Paris on 1990, he began the cello with René Benedetti, then studied successively with Roland Pidoux at the Paris Conservatoire, Heinrich Schiff at the University of Vienna and Clemens Hagen at the Mozarteum in Salzburg. At the same time, he took part from 2005 to 2011 at Seiji Ozawa International Music Academy Switzerland. A sought-after chamber music player, Victor founded in collaboration with Adam Laloum and Mi-Sa Yang the piano trio “Trio Les Esprits”, and recorded several CDs for the label Mirare. It is for the same label that he released in 2016 an album of sonatas with the pianist Adam Laloum which received a Diapason d’or of the Year 2017, ffff by Télérama as well as the CHOC by the magazine Classica. In January 2019, Victor Julien-Laferrière will release a new album devoted to Schubert with the Trio Les Esprits (Sony Music). He will also record an album in duet with the pianist Jonas Vitaud for the label Alpha Classics (release Automn 2019).